My Summer Cottage in Babylon: Alert!! The Snuggies have landed. 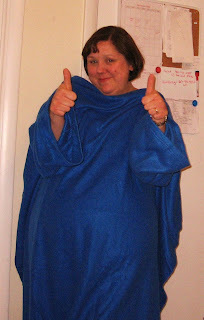 I repeat, the Snuggies have landed. Roger that, Brandi. Very cool...er, I mean hot! They are just backwards robes!!!! Brandi, this MADE. MY. DAY. I don't know if I gained or lost respect for you today. I gained respect because you had the courage to admit that you actually BOUGHT a backwards bathrobe. But at the same moment, I lost it beacause you actually bought one. You look happy. I guess it was worth the money.